Cable locks and U-locks can be easily cut in seconds. I wanted something to add a second layer of protection for my $1,200 bike. I created the solution and along the way found another benefit! I often would go on bike rides with no plans to stop and not carrying a lock. In spite of that, I kept running into times where I wanted to stop for a minute - bathroom break, run in a convenience mart, or just pick up that one item I needed at the store. I'd run in and hope my bike was still there when I returned. Quick Stop made my bike safer for long stops when used with a U Lock AND convenient for doing quick stops. I designed Quick Stop™ Bike Lock as a simple solution. Lock it and the bike functions as usual. Unlock it and the handlebars are disengaged from the front wheel. Simply put, the bike cannot be ridden. If your bike is touched, Quick Stop sends a tamper signal to your cellphone. 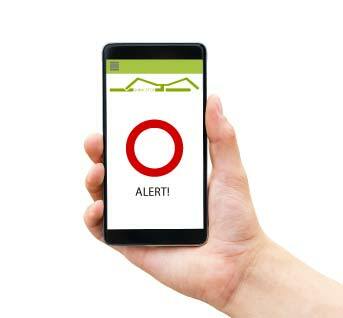 One movement of your bike and your phone is alerted. Since your bike cannot be ridden away, you'll be outside before anyone has moved ten feet. With Quick Stop lightweight bike lock integrated into your steering tube, it is always there and ready to be used. I love it. You will too. Clip off your typical bike lock and your bike is gone in 5 seconds. Break Quick Stop and your bike becomes no more usable! The phone alert means you're there with a friendly "like my bike?" before they know what's going on. 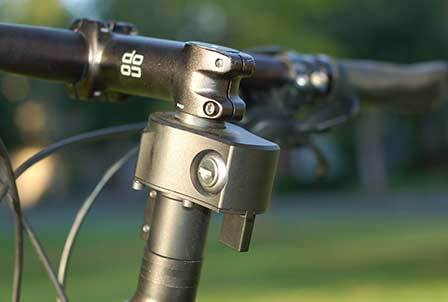 Quick Stop lightweight bike lock is the perfect solution for the urban cycler. It is great for quick runs to the store. It fits the urban lifestyle. Ditch the car for trips in town. Store your bike in the apartment front hall or bedroom. Just unlock Quick Stop and rotate your handlebars and your bike is out of the way. Quick Stop is great for the weekend cycler. Unlock Quick Stop and toss your bike in the car. Being able to manuever the handlebars independent of the front wheel makes it much easier to load in your SUV. Unlock Quick Stop and stacking multiple bikes on the rear bumper rack is that much easier. At the motel, on the back of your car or in your garage at home, combine Quick Stop lightweight bike lock with a Krypto lock and your bike is that much harder to steal during the night. While a thief is cutting through that traditional lock, Quick Stop is alerting your cell phone and keeping the thief from riding off. Can It Still Be Stolen? Quick Stop is for stops where you are in a store or a restroom. Usage is for situations where you are less than 150 feet from your bike. At that distance once your phone alert goes off you should be able to return to your bike in less than 10 seconds in most specialty stores and 15 to 20 seconds in most big box stores. It is possible for a thief to load your bike into a pick up truck and drive away before you get there. For that reason and if this is a concern for you, I suggest you park your bike away from traffic lanes and parking spaces. Increase the amount of time it takes to carry the bike to the truck. Absolute worst case you should have a good description of the vehicle along with the license plate number for the police. There is the chance a person attempts to take your bike by riding off on only the rear wheel (see what it takes to do this trick) doing what is known as a wheelie. Doing a wheelie requires controlling both the bike's side to side motion and front to back motion. Side to side motion is controlled by turning the handle bars left and right to move the center of balance. This is deceptively difficult with Quick Stop because turning the handlebars does not move the wheel. The thief is more than not likely to lose their balance. No bike lock is secure from professional thiefs just as no car lock, door lock or safe is completely secure. The goal is to significantly reduce the probability of theft and increase your riding pleasure.